Recently Queen’s administrators approved the erection of a “free speech wall” by the Queen’s Students for Liberty and almost immediately had it removed by campus security. The administration alleged that it featured “racial slurs and hateful language” that crossed the boundaries of free speech and “violated the university’s policies.” Until someone explains more specifically what the writing on the wall was, it will remain difficult to judge the rights of this matter. As emailed by Ross Sutherland to community members, 15 April 2013. Media Release – April 15, 2013. Kingston – On Saturday April 13, 9,885 people voted at 55 polling stations spread from Sharbot Lake to Gananoque to Amhertsview in a community referendum on whether the region’s new hospital should be a public non-profit hospital or a P3 for-profit hospital. 96% voted in favour of keeping the new hospital public and non-profit. 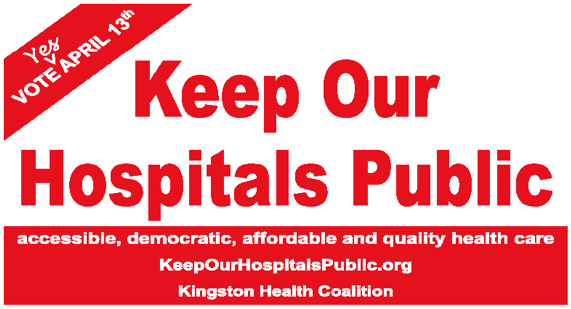 Vote YES to Keep our Hospitals Public!